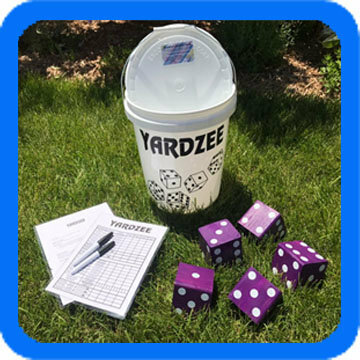 Yardzee, inspired by the classic board game Yahtzee, is a great lawn game for family fun! Includes 5 wood dice that can be stained or handpainted to the custom color you choose. They are approximately 3.5". The 5-gallon bucket makes a great rolling cup and storage when you're finished! Also includes 2 laminated scorecards and 2 dry erase markers!